Being one of the most arduous phases of PTE Speaking section can browbeat even the most proficient candidate. In this phase, the candidate has to describe the displayed image within just 40 seconds, which surely is not an easy task. 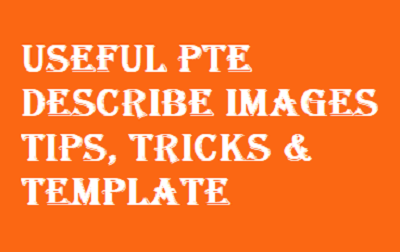 To help you out we have listed effective PTE Describe image tips that will help you conquer this phase without much trouble. 1. Starting your sentence with witty words such as illustrate, depicts, represent etc. is a great idea. 2. In order to describe the graph briefly, you can use at the top, on the right/ left-hand side etc. 3. Always try to use the words you are more comfortable with and can describe the image effectively. 4. Your fluency, as well as pronunciation, are equally important as the image description. 5. It is recommended to make use of words like half, quarter etc. instead of “%”. 6. It is very difficult to describe the image in just 40 seconds, so always cover all the main aspects of the image as soon as possible without repeating any word. 7. Identity whether its a bar chart, line graph, pie chart map or table and speak accordingly. The candidates should follow the below Describe Image structure in order to make their description sound smart and organized. 1. Introduction – Begin with a general statement by saying “The graph shows/displays/illustrates” Try to include the title of the graph within your first paragraph. 2. Body 1 – After the introduction, you can speak about the highest value that is displayed on the graph and explain it. 3. Body 2 – Now, you can speak about the main idea that the graph is all about along with the lowest value and other crucial facts. 4. Conclusion – Conclusion is very important to complete your description. In this part, you can speak what you think about the data the graph caters.